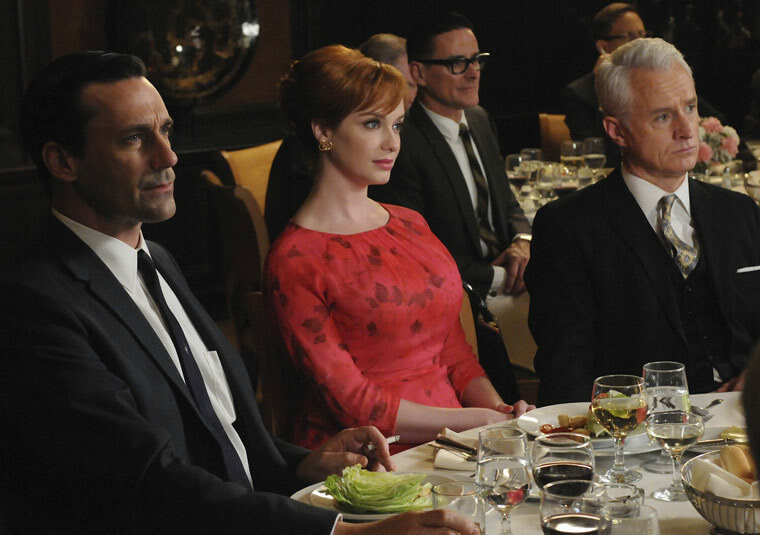 On the night that MAD MEN won its third consecutive Emmy as outstanding drama series, the episode dealt with Don winning a Cleo award for his Glow Coat campaign — and celebrating just a little too hard. Don (Jon Hamm) and Peggy (Elisabeth Moss) began by interviewing Danny (Danny Strong, “superstar” Jonathan from BUFFY THE VAMPIRE SLAYER), a punk with no resume, no skill (all his ads were variations “The cure for the common…”) and no prospects — except that he’s Jane’s cousin, which put Roger (John Slattery) in his corner. When Don laughed about how unqualified the kid was, it prompted Roger to flash back to his first meeting with Don. Roger was buying a fur coat for Joan (Christina Hendricks) at a place called Heller’s, and Don was the salesman! Don also handled the advertising for the shop, and wanted to get in the game for real. Roger was dismissive, so Don slipped his portfolio into the box. Roger was disgusted when he found it. BURN NOTICE finales are always heavy on game-changing plot developments (consider last summer’s capper), and this one was no different – which was good and bad. Good because it was exciting and fast-paced, with a number of great character bits; but bad because once again the goal posts were moved, making a lot of what Michael accomplished this season moot. Picking up from last week, Michael (Jeffrey Donovan) arranged to get ostensible big bad John Barrett (Robert Patrick) to Miami, but before he could confront the villain with Simon’s book-code bible, Jesse (Coby Bell) discovered that Michael was responsible for burning him in the season premiere. Michael wanted to continue to pursue Barrett, reasoning that taking out the man behind all the strife in the world might get Jesse back in the good graces of his bosses. Not to mention getting Michael back in the game (officially). For my money, the summer finale of ROYAL PAINS came at just the right time, interrupting a series that has been suffering a bit of sophomore slump. It feels to me like this show needed a break. It has been meandering along, good-naturedly enough, but also kind of aimlessly. The recurring presence of Henry Winkler as Hank (Mark Feuerstein) and Evan’s (Paulo Costanzo) shady daddy, Eddie R., lent the illusion that there was an ongoing umbrella story for the season, but it’s been more like an on-again, off-again distraction. Initially, Eddie was just a pure tease; it’s only recently that much of his story was larded on. I have to admit that I did not foresee Eddie turning out to be a government informer targeting Boris (Campbell Scott). Top marks for that little inversion of audience expectations. Auggie took the spotlight this week, as COVERT AFFAIRS viewers got a long look at him on a mission as a field agent. The problem with the episode was, while Auggie is a unique character, the plot they gave him was strikingly rote: Bring in a former flame. Oh, gee, where do Auggie’s loyalties lie? There was a cyber criminal on the loose, one who demonstrated her power by bringing down the electrical grid in Washington, D.C. The No. 1 suspect was Auggie’s (Chris Gorham) former girlfriend, Natasha Petrovna (Liane Balaban). He was assigned to revive his old cover and visit DataTech, a sort of Comic-Con for true nerds. Annie (Piper Perabo) was assigned to go along as Auggie’s “eyes.” But first, Auggie had to get out of bed with his current flame: TV reporter Liza Hearn (Emmanuelle Vaugier). As they bantered, he fretted about being put on trial for espionage. She hinted that Auggie is not the only person at CIA she is sleeping with. RESCUE ME engaged in a classic piece of misdirection: with the audience distracted by Lou’s failing health, the-powers-that-be sucker-punched Damian – and viewers. This episode is called “Good-bye” for a reason! The action picked up moments after last week’s cliff-hanger, with Mickey (Robert John Burke) having dinner with Tommy (Denis Leary) and family. Mickey made small talk about Sheila (Callie Thorne) moving into a new place, and pointedly asking Tommy whether he’d ever been there. Tommy pretended to be eating his spaghetti, and finally faked a huge choking fit to avoid answering. As Mickey tried a particularly hostile Heimlich, Sheila arrived, misinterpreted and panicked, shouting, “We didn’t do anything!” Finally, Mickey said he caught Tommy and Sheila on top of each other, with her dress off. Tommy couldn’t explain, so Sheila jumped in and described how Tommy grabbed her from behind and kissed her and ripped her dress off! Well, he admitted he kissed her. But he blamed her “vixeny” look. They were angry and swept up in the moment and kissed, but realized it was stupid, and tried to stop, but fell. Tommy claimed he “cared deeply” for Sheila, but only really loves Janet. Sheila of course claimed he loved her for five years, and Sheila broke off the relationship because she’s in love with Mickey. There’s no better way to describe this week’s MAKE IT OR BREAK IT than to call it a tear-jerker – because there was a lot of crying going on. The storyline I am most invested in is the Payson (Ayla Kell)/Sasha (Neil Jackson) relationship, and last week ended with her impulsively kissing him and running off in shame. He’s 35 years old and she is 16, so naturally things were awkward between them. She couldn’t help noticing how he was hesitant to even touch her during practice. “I’ve ruined everything,” she growled in frustration. Sasha finally decided to confront the elephant in the room by talking about the normally complex relationship between coach and athlete. He explained that his father was actually disappointed that Sasha won the gold because he was competing for England, not Romania. So he split with his father – who was also his coach: the legendary Boris Belov. But Sasha praised his replacement coach, because he “made me an Olympian.” (He even admitted that had his coach been female, he probably would have kissed her!) The most important aspects of the coach/athlete relationship are trust and communication. “I trust you,” she declared. “You didn’t ruin anything,” he smiled. 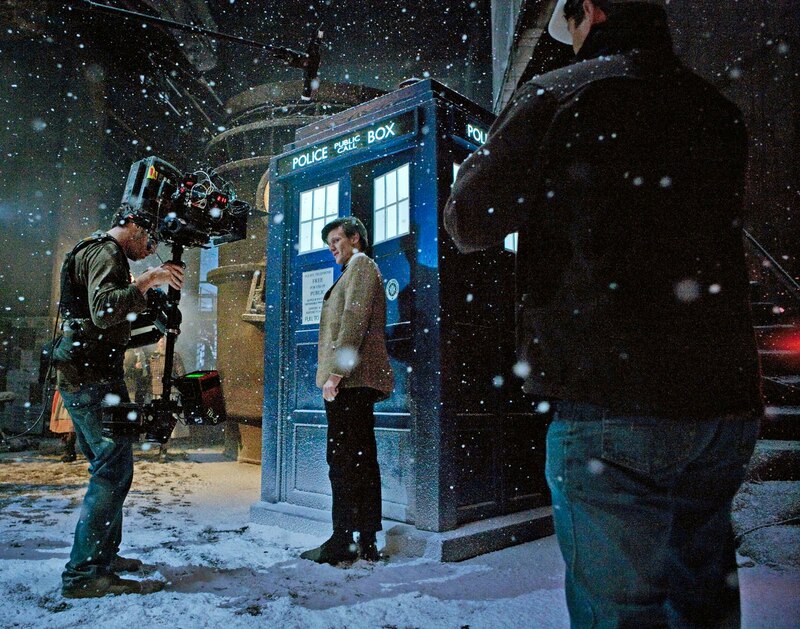 The BBC’s official Web site this week released the first image from the filming of the 2010 DOCTOR WHO Christmas special. I am thrilled and relieved to see that Matt Smith will be wearing essentially the same costume, though I wouldn’t be surprised to see him don a festive bow tie! Click the pic to see it in its hi-rez glory. -Smith, Karen Gillan and Arthur Darvill return as the Doctor, Amy and Rory, respectively. –Sir Michael Gambon (Dumbledore in the Harry Potter movies) will be a guest star, as will a Welsh opera singer named Katherine Jenkins. -It will be an hour long. I don’t know about you, but I’m already impatient for Christmas! I loved loved loved Smith’s interpretation of the 11th Doctor, and I’m dying to see more…! Is it Christmas yet? Is it?